I wrote my first grant proposal for my PhD research in the first month of the graduate program. The project I proposed involved monkeys and humans. The next proposal I wrote dropped the monkeys. The one after that changed to a different group of humans. I was introduced to a new theoretical perspective and had to re-frame my research questions. I changed my research questions. I went through several drafts trying to match good hypotheses with research methods that could appropriately test them. I went through a few more drafts trying to cut the project to a reasonable size for a graduate student budget and one year of field work. The only thing my final dissertation proposal and that very first draft had in common was tuberculosis. I thought I had a pretty good proposal (I passed my defense, I got funding), and the drastic changes were going to be over with. Especially after getting funding, I felt like I had a plan to uphold. But research is a really messy thing, especially when you’re doing it out in the ‘real world’ (not the controlled setting of a lab). You received funding, but it arrives weeks later than expected. Trying to send grant money overseas from your university. Learning all the strict, non-flexible rules the accountants made up to make their life easy and yours difficult. Filling out paperwork to get special permissions that take so long to approve they arrive two weeks too late. Everyone you need to talk to is on vacation. All the time. Any day you really need to go to a store, government office, or mail something is a national holiday. You discover that items in your budget will actually cost 4 times more than you expected. Your field vehicle breaks down. Your insurance, which says it will tow your broken down vehicle for free – even if it’s in a neighbouring country! – has a clause that doesn’t include the place where you do your research. It rains heavily for several months, making the roads to your research site impassable. In the previous three years it hadn’t rained at all. Your second field vehicle breaks down. You catch a tropical disease. Your field site becomes unsafe due to crime, civil unrest, or jaguars. I could go on. (All of these are personal experiences except #10. Although I’ve been warned about jaguars.) I stand by my original proposal, it was a good plan, but it just won’t survive this onslaught of administrative delays, logistical difficulties, and bad luck. 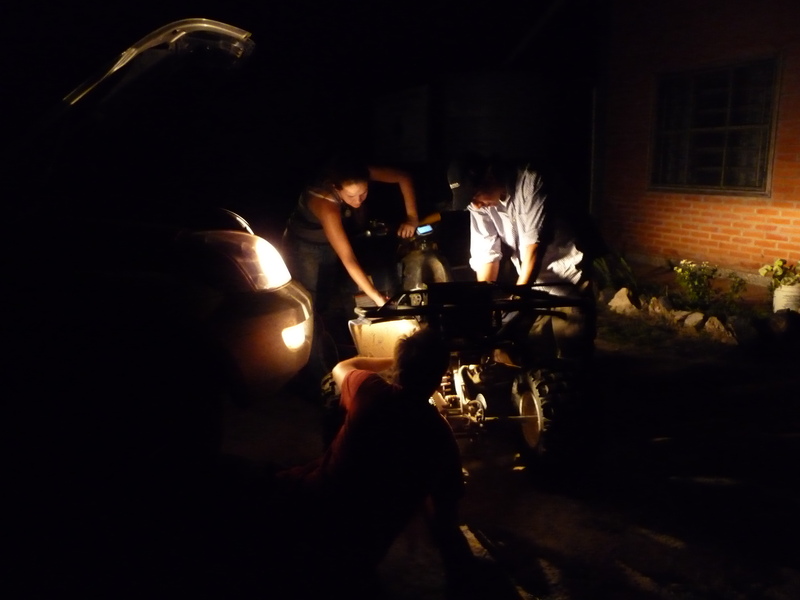 My main problem is that I don’t have enough remaining time in Paraguay to collect the longitudinal data I really wanted. I was planning side projects I wanted to work on even before I arrived in Paraguay and now these may become central parts of my dissertation research. In particular, I have archival data from health posts that is far more detailed than expected. In my earliest meetings with collaborators and community leaders they expressed interests in research outside the scope of, but related to, the project. I acted on what they said and have a neat nutrition project in the works. I’ve been following the work of other researchers and thinking about how I could get a similar data set in my study communities that would be comparable to theirs. I am super geekily excited about the questions I designed for the next round of surveys, and piloting them this week to see if they will work. I’ve been working on ways to maximize the data I can get with the time I have to work with. I’m expanding my sample size and taking on more research assistants. I have applied to every funding opportunity I could find, in hope of funding a second round of data collection in January (no luck yet). A lot of these side opportunities were just as unexpected as the logistical and administrative nightmares I described above. So, I’m still going to have a dissertation to write up. Just not the beautiful, cohesive dissertation I originally planned. Some good friends of mine keep reminding me that dissertations rarely end up what they set out to be. I’m learning to love my new franken-dissertation project. My unsolicited advice to other grad students: Plans are great, but always have several plan Bs!